Lock in a great price for Xenonas Achnoulas – rated 8.8 by recent guests! A very good guest house in one of the most beautiful places in Greece! Don't judge it as a hotel, it provides the basic facilities for accommodation, a bed, towels, a soap and a very clean and tidy room to stay on, all in traditional Greek style. A kitchen is available to make your own breakfast / meal, if you want to buy one, the nearest place is Kalpaki about 13 km away. Easy ride in the summer, it may prove tricky in winter. It has also a restaurant but my stay was too short to give it a try. Lots of parking outside and - always with a car - near to all famous destinations in the area for some quality outdoors activities "mountain-like". Excellent value for money choice IF you want a guest house and NOT a hotel. Totally recommended. 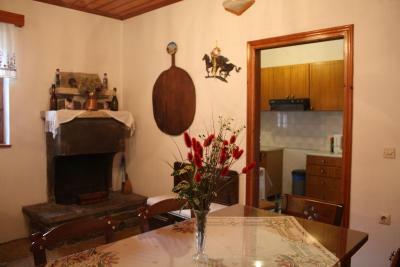 Nice host, beautiful country house with garden. Good value for money. Also we made a late check in and hosts was welcoming. Simple, convenient and clean guest house suitable for families. Basic facilities in a very nice big house, located in the entrance to Ano Pedina. The staff hardly speaks English but they were very welcoming and helpful throughout our whole stay. Food, drink, friendliness and helpfullness were excellent. The kitchenette (not inside the room, but in a common area) was very useful for breakfast. Note that there is no minimarket in the village or in the near area. You must bring supplies with you or drive about 45 minutes to the nearest town. The location of the village enabled shorter trips to various places in the zagoria area. Nice authentic house with attention to ancient details, such as the way the door closes, the furniture etc. A strategic location for many trips in Zagori, very friendly staff (english speaks only their son but it does not matter), you can have tasty breakfast for 5E if you want, there is good taverna and cafe on the "square". The nearest infocentre for the region Zagori is in Aspraggeli, but they had a problem with English too (but maybe this will be better in the season). One of our best sellers in Ano Pedina! Located in the scenic village of Ano Pedina, the stone-built Xenonas Achnoulas is surrounded by a lush garden. It offers rustic-style rooms with views to Mount Mitsikeli. 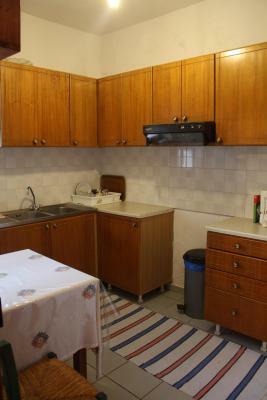 Rooms at the Achnoulas are fitted with wooden floors and ceilings and include a fridge and TV. Each has a private bathroom with shower. Taverns and shops are within a 3-minute walk. The famous Vikos Gorge is 4.3 mi away. Ioannina Town is at 20 mi. When would you like to stay at Xenonas Achnoulas? 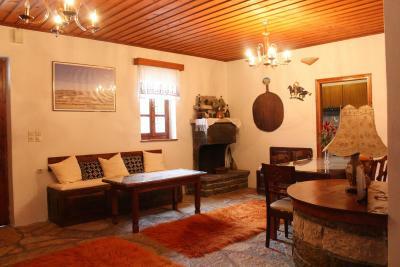 Xenonas Achnoulas is a traditionally built guesthouse, a typical example of Zagori architecture. House Rules Xenonas Achnoulas takes special requests – add in the next step! The bathroom is small and has no drainage for the shower which has no enclosure or curtains so getting some water on the floor is inevitable. No floor drainage in the bathrooom means water will just sit there until it evaporates. Beautiful location! The owners are very welcoming and there is a homey feeling. The hosts where not very communicative in English. A few times the Wi-Fi failed and there was not much to do about it. Sign on Hotel does not say the same as on booking, a little confusing! Better signs on he entrance to the house/ hotel. Name is not on the building! Map very confusing, hard to find the place.